In April, four Indians took off for Australia. Three of them were traditional folk painters: Mantu Chitrakar, a Patachitra scroll painter from West Bengal; Pushpa Kumari and Pradyumna Kumar, Mithila-style painters and sculptors from Bihar. The fourth was me, serving as coordinator, translator, guide and cultural interpreter. Two of the artists had never flown before, nor had they ever been outside India. None of them spoke English. None of us had ever been to Australia before. Crosshatched 2009 was an innovative cross-cultural project supported by the Australia India Council, which aims to promote closer ties between the two countries through interesting cultural exchange between traditional Indian artists and Australian artists. Conceptualized and coordinated by Sandra Bowkett (Australia) and by me (India), It is based on the belief that art talks, binds and brings closer people who may have nothing else in common. The essence of Crosshatched 2009 is an inquiry into whether there is a “language” of art which will help people from different ends of the world speak to each other without having any language in common. Besides the Indian artists, there were their Australian counterparts waiting on the ground. So how would these artists speak, not just to the world but to each other? Mantu Chitrakar is an accomplished singer as well as a scroll painter. Pushpa Kumari excels at extremely fine pen and ink drawings. 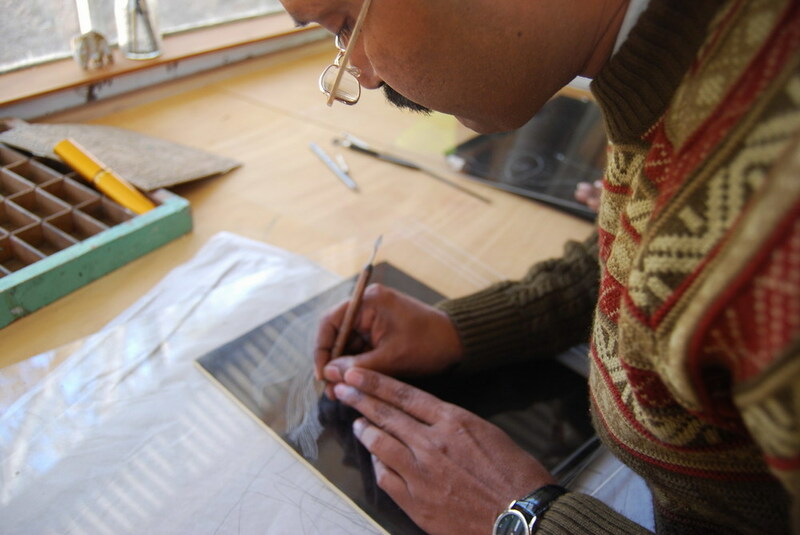 Pradyumna Kumar is an award-winning painter and papier-mâché sculptor. Mantu and Pradyumna had never been on a plane, so their flight to Bangkok was memorable. It was subsequently immortalized in a scroll Mantu painted during his stay in Australia. See what I mean when I talk of a universal language of art? The Australian artists involved included Jan Palethorpe, a printmaker who conducted printing workshops for the Indian artists, and ceramicists Vipoo Srivilasa and Ann Ferguson. 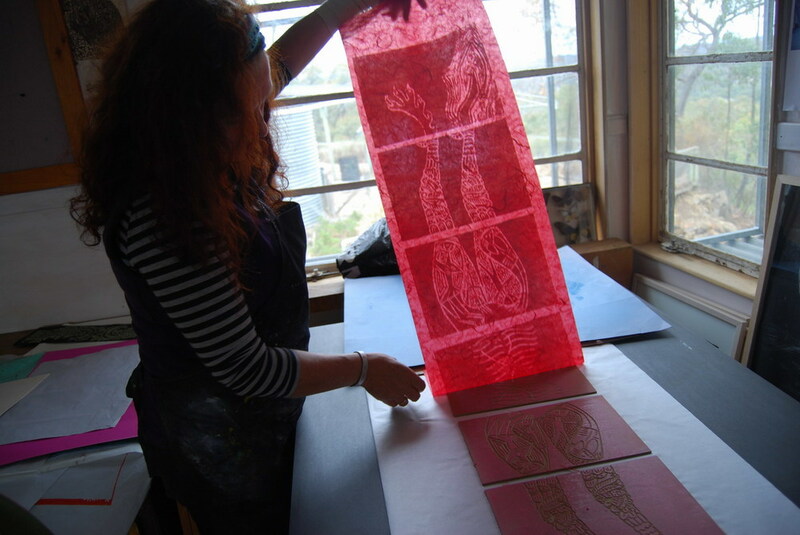 The printmaking workshops with Jan Palethorpe enabled Mantu, Pushpa and Pradyumna to work with lino cuts and etching in a studio scenario unlike the home environment they typically made their creations in. In India, most traditional artists are nameless, faceless carriers of tradition and there is little scope for them to expand their artistic experience. 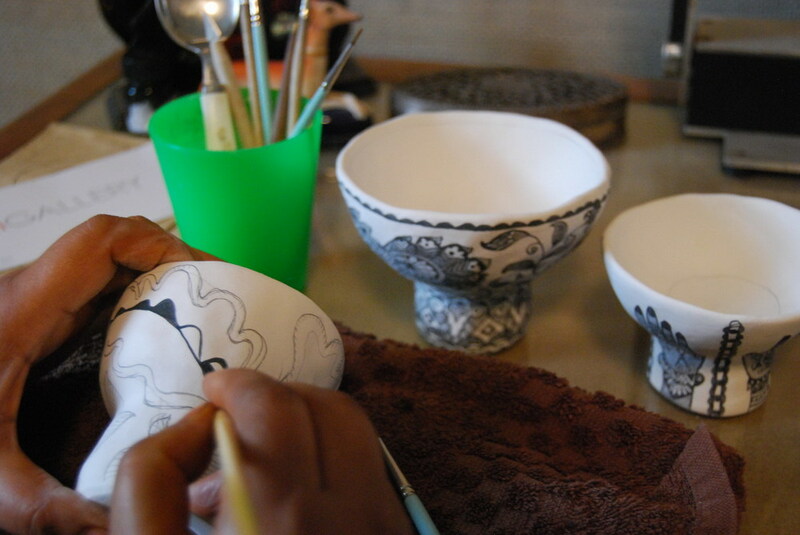 The idea was not to encourage them to abandon traditional practices but to just experience other art practices that exist. 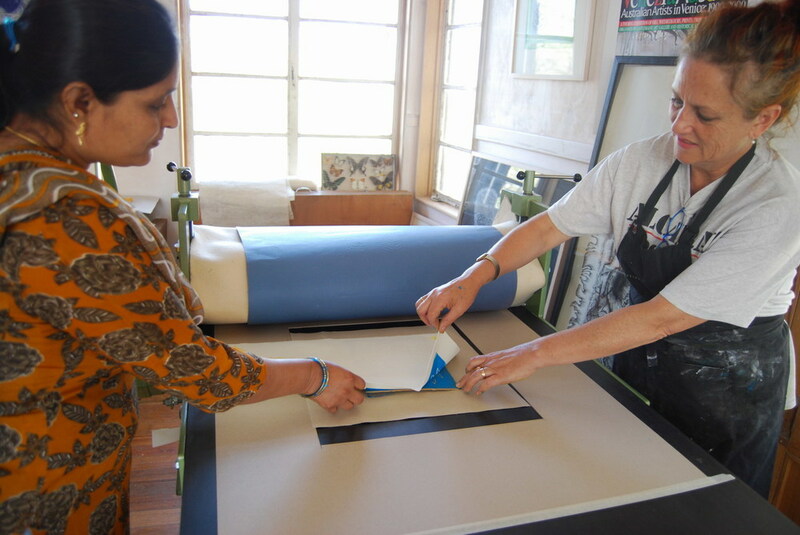 All three Indian artists enjoyed the printmaking process and worked on both traditional imagery and personalized ideas. Both Pradyumna and Pushpa expressed interest in incorporating Australian motifs such as the kangaroo into their works. They were, however, concerned about the issue of original vs duplicate when it came to making multiple copies of the prints. For Mantu, who often repeats his imagery, his painted works are “original” in that they are begun from scratch every single time and are not printed. For Pushpa and Pradyumna, there were concerns about how the availability of prints would impact the sale of their original artworks. Also, the amount of paints and inks used to colour the etching plate bothered them. 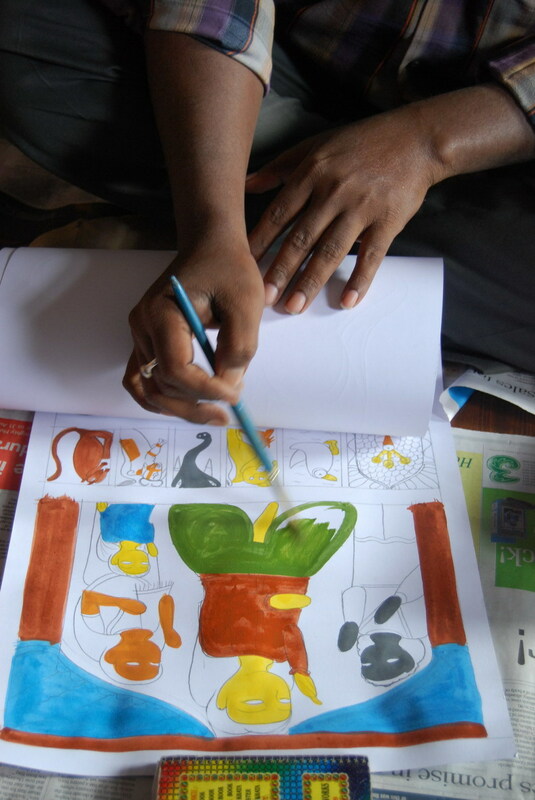 Each of the artists was accustomed to painstakingly coaxing out colour from natural materials. To them, just rubbing the various inks off the etching plates seemed wasteful. The Indian artists also wondered about the viability of printing folk art in India, where hundreds of practitioners of any particular art tradition struggle to sell their works. For the Indian artists, who pretty much work intuitively, working in the “process-oriented” art world of the West was interesting, even though they felt that their Australian counterparts “think too much”. For the Australian artists, the expertise of the Indian artists and their rootedness in their culture was both inspiring and challenging. Workshops with Australian schoolchildren of all ages at ARTPLAY made for a hands-on experience of Indian art for the young. The cow dung-coated paper that Mithila artists typically work on evoked great interest and led to discussions on how cow dung was used in India for fuel and in traditional mud homes. The fenugreek seeds used as a binder in the papier mâché spun also off conversations about Indian food. THe collaborations between the Indian and Australian artists were a particularly important component of ‘Crosshatched’: to see where ideas mesh even without common languages, to seek out the essence of communication between people, particularly through art. Language was a major issue. Pradyumna could read and write English and speak a little of it, while Mantu and Pushpa were not very proficient. The Australian artists other than Sandra, who speaks a little Hindi, knew no Indian language. So from Day 1, our landing in Australia, we could see for ourselves interesting means of communication taking place. Art was definitely a great binder. Two interesting collaborations resulted: between Pushpa Kumari and Vipoo Srivilasa on one hand, and Pradyumna Kumar and Ann Ferguson on the other. Pradyumna and Ann found a common interest in trees. Pradyumna is the first Indian to win Unesco’s Noma Concours award for illustrated picture books, for his story of the walking, talking tree in How the Firefly got its Light. Together, they created a gigantic tree, a hybrid of the Indian banyan and Australian eucalyptus, and filled it up with birds and animals from both lands. 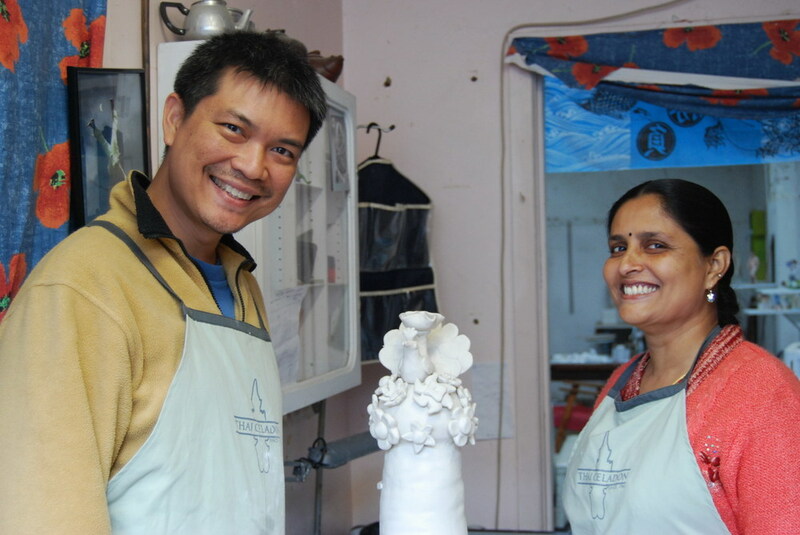 For Pradyumna, working with clay was easy as he typically works with traditional papier-mâché pulp, which has clay incorporated into it. Ann's Story. Mantu created a new scroll and composed a new song, “Come to Melbourne”, featuring the scenic beauty of the Australian bush, the massive buildings in Melbourne, the people we met, and even the Melbourne Cricket Ground (a dream visit for the three Indian artists) and the free trams of Melbourne. Meanwhile, the storytelling scrolls made by Mantu and his family inspired 12-year-old students of Pasco Vale School in Melbourne to work as a group and create their own scrolls based on an Indian story. Even the five- and six-year-olds at the Early Learning Centre, University of Melbourne, made drawings of how they came to school in the morning as they watched Mantu paint a scroll over two days of his visit to the Centre. Mantu Chitrakar’s Scroll Come to Melbourne was purchased by the Australia-India Council. 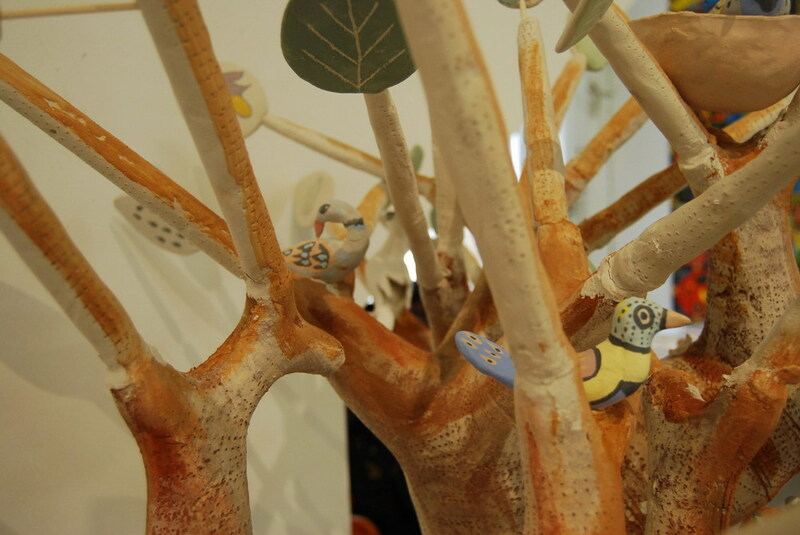 Tree of Life has been installed at Melbourne University Early Learning Centre, Abbotsford. This project was supported by the Australia-India Council.